Google has given its most famous robot a major update. Now it acts even more human. Atlas, the humanoid robot created by Alphabet (GOOGL) company Boston Dynamics, can open doors, balance while walking through the snow, place objects on a shelf and pick itself up after being knocked down. The new version of Atlas is smaller and more nimble than its predecessor. At 5-feet, 9-inches tall and 180 pounds it's about 7 inches shorter and 120 pounds lighter than the first version. It's fully mobile too -- the previous version had to be tethered to a computer. Atlas was created to perform disaster recovery in places unsafe for humans, such as damaged nuclear power plants. The robot made its debut in 2013 during a competition held by the Defense Advanced Research Projects Agency. The new version of Atlas is a result of seven computer research teams from around the world who were contracted to develop software to give Atlas a better brain. Atlas uses sensors embedded in its body and legs to keep its balance. Lasers in its head help Atlas sense and avoid obstacles, navigate, assess terrain and move objects. With hydraulically-operated joints, Atlas can scan its surroundings and maneuver through complex environments: walking, climbing stairs and dodging debris. 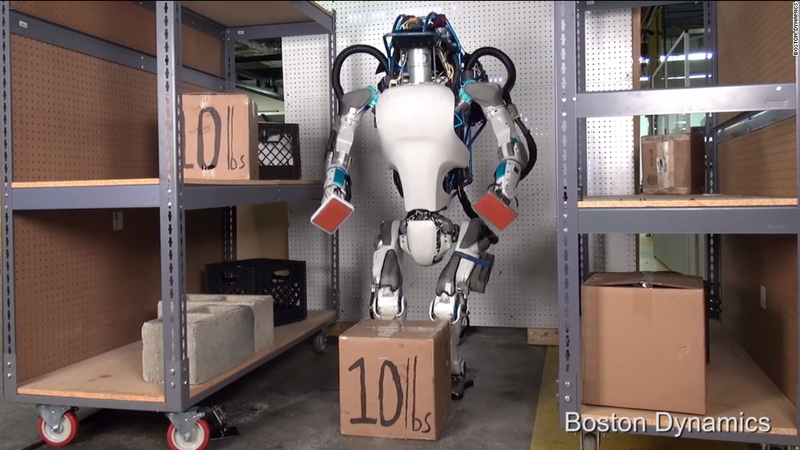 In a YouTube video, a Boston Dynamics employee move a box away from Atlas with a hockey stick. Atlas quickly adjusts and moves to pick it up. Atlas also gets knocked down from behind -- and quickly does a pushup to get back on its feet. Boston Dynamics has built a strong reputation for its heavy-duty robots that can run faster than Usain Bolt, climb walls like a gecko and jump as high as 30 feet. It has close ties with the U.S. military. The company made waves a year ago when it debuted "Spot," a four-legged robot that walks like a dog. After Boston Dynamics employees repeatedly kicked Spot in a YouTube video, PETA weighed in, saying that it believed the video was in appropriate. Alphabet has amassed a large collection of robotics companies over the years, though Boston Dynamics is by far the biggest. Alphabet continues to invest in products and technologies that it believe will be splashy and profitable in the future.